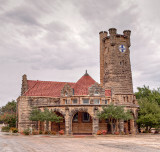 This gallery is intended to show the old train depots (stations) that were built when the trains pressed westward to help expand the settlement of the country and aid the transportation of passengers and goods to across the country. 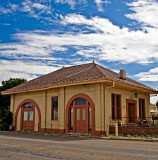 Although they are old and probably not in use as passenger stations at this point they are interesting structures in themselves and many are preserved as a historical artifacts in the town of origin. Most were built not by the town but by the railroad companies on their trip west and expanded commerce greatly in the early settlements. Most of these stations are now owned by the towns in which they are located having been donated to the town by the railroads when they ceased passenger service. The Logansport, IN train depot. The DeRidder, LA Railroad Depot. Great gallery !!! Shame that all of these don't serve passengers anymore. It's good to see that the towns haven't let this history pass away. Nice Group of Train Depots man! VOTED! !